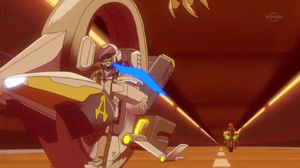 Jack Atlas (ジャック・アトラス, Jakku Atorasu) is a character in the Yu-Gi-Oh! ARC-V anime. He is an alternate universe version of the Jack Atlas that appeared in the Yu-Gi-Oh! 5D's anime. He was the Duel King (Master of Faster in the dub), a native of the Commons section of New Domino City within the Synchro Dimension. He rose through the ranks and won the Friendship Cup, allowing him to live in Topsiders. 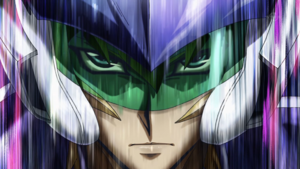 After his defeat by Yuya Sakaki, he crowned Yuya as the new Duel King and became an ally of the Lancers. Jack in his regular and Turbo Dueling outfits. Jack's design is almost identical to that of his Yu-Gi-Oh! 5D's counterpart. Jack has purple eyes, fair skin and spiked blonde hair, with two much longer strands in front of his ears that hang further down the rest of his hair. His other accessories include a neckband, a belt buckle and earrings in the shape of the letter A, the first letter of his last name. Jack wears a long white trench coat lined with purple, with spiked shoulders over a white plunging shirt, grey pants, and white boots, in addition to a gray undershirt not worn by his original counterpart. As he did in 5D's, Jack also commonly wears a Turbo suit that is similar in design to his casual clothes; the top portion of the suit closely resembles his coat, with a slightly smaller collar, an undersuit of the same material underneath, full gloves, and no spikes on the shoulder pauldrons, while the trailing straps of his upper suit extend under his belt and to his knees. He retains the belt and boots that he wears out of his Turbo suit, and also wears a white helmet with a green visor and a purple peak. Jack's personality is similar to his 5D's version; he is a confident and powerful Duelist who believes his own power can overcome his enemies. He can be boastful and arrogant in this regard, successfully predicting how the Duel would play out before his Turbo Duel against Yuya Sakaki and that he would be overwhelmed by his power. 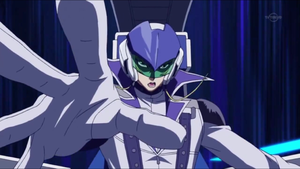 According to Sam, Jack's apparent arrogance is a product of his time spent among the Topsiders citizens, but Chojiro Tokumatsu later theorized that Jack's somewhat annoyed demeanor is due to other Duelists not being powerful enough to test his own limits; when Yuya Sakaki finally did so in Jack's eyes; Jack was ecstatic. Similar to his 5D's counterpart, Jack is generally more malicious in the dub than in the Japanese, but he retains his instructive side. Jack also sees himself as an Dueltainer, but his philosophy on this is quite different from Yuya's, who uses flashy presentation and tricks. He believes strength in Dueling itself is used to entertain the crowd and views Yuya's Dueltaining as self-satisfaction only. After witnessing Yuya use Sam's "Tuning Magician" to Synchro Summon "Enlightenment Paladin" and win against Shinji, Jack started to respect Yuya. Unlike his 5D's counterpart, Jack does not show surprise as easily, as he didn't bat an eye to Yuya performing the unheard of in the Synchro Dimension Pendulum and Xyz Summoning, nor was he shocked at all when Sergey fused with his Duel Runner and even called it boring. However, he was quite surprised when Yuya Synchro Summoned without using a Tuner monster. He maintains a high level of honor while Dueling, saving Sergey's life when he was about to fall off the course the first time and attempting to do so the second and last time. Upon losing to Yuya and consequently losing his title as Duel King, Jack graciously accepted his defeat and welcomed Yuya as his successor, and he even showed comical anger when Yuya accidentally continued to refer to him as "King" after their Duel. Jack is also very perceptive; he was able to guess Riley's backstory rather accurately, as well as deduce that Declan had a purpose of his own. Like his 5D's counterpart, Jack believes that Duels are a clash of souls, and he shares a strong bond with his ace monster, "Scarlight Red Dragon Archfiend", calling it a symbol of his Dueling and of his soul. His bond with his ace is so strong that he consistently prevents it from being destroyed as seen in his Duel with Sergey. However, he is greatly disapproves of Yuya's Dueltaining philosophy as merely an imitation of his father's and urges him to make his own Dueling instead. In the dub, Jack collects his beliefs under the ideal of the "gift of grit", believing that one who has the grit will be a strong Duelist. 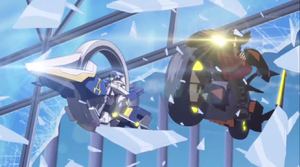 Similar to Yugo, Jack prefers to remain on his Duel Runner while Dueling, whether he is Turbo Dueling or not. As a Turbo Duelist he is very powerful, becoming the first Duel King from the Commons and gaining access to the Topsiders despite his area of birth. He quickly adapted his Turbo Dueling to Action Dueling when "Crossover Acceleration" was used in conjunction with "Speed World Neo". Jack's riding skills have been shown to be phenomenal, performing spectacular racing techniques to overtake Sergey Volkov's Duel Runner-fused form. A young Jack finds "Tuning Magician". Jack was born in the Commons area of New Domino City and was an orphan. He lived in constant fear for years. One day, a "Tuning Magician" card fell down from the Topsiders section of New Domino above him. This card inspired Jack, and he wished to return the card from where it came from, though he believed that the only way to do that was to become stronger. Through Turbo Dueling, he was able to eventually win the Friendship Cup, and was then allowed to reside in Topsiders. Through winning the Cup, he earned the title of Duel King. On one occasion outside an event, Jack met Sam, a Commons child working for the Topsiders, who explained that he was a fan of Jack. Jack gave him the "Tuning Magician" card, claiming that it was the most suitable for him. Sam interpreted this as calling him worthless due to the low Level and ATK value that the card possessed. Jack became an idol and hero to many young children in the Commons, including Yugo and Rin. This motivated them to train hard so they could face off against him one day. However many Commons, like Crow Hogan and Sam considered him a traitor as he did not do anything to rectify the situation between the Topsiders and the Commons. When the Lancers were dragged before the High Council, they agreed with Jean-Michel Roget of Sector Security to have Yuya Sakaki Duel Jack in an exhibition match the night before the Friendship Cup would start. Jack during his Turbo Duel against Yuya. Jack entered the arena after Yuya did and before the Action-Turbo Duel started, he told the public how the Duel would unfold. Jack won the first corner against the novice Turbo Duelist Yuya as he predicted and proceeded to summon "Red Wyvern". Yuya immediately Pendulum Summoned using all the cards in his hand, successfully bringing out "Rune-Eyes Pendulum Dragon" and "Dark Rebellion Xyz Dragon". Yuya attacked, attempting to win with an FTK, but Jack survived using a combination of "Evasive Evasion" and "Reject Reborn". Jack told Yuya that his way of entertaining was wrong because it was self-satisfaction, proceeded to Synchro Summon "Scarlight Red Dragon Archfiend" on his next turn and used its effect to destroy all Yuya's monsters and attack him directly with it. This won Jack the Duel in an OTK and knocked Yuya off his Duel Runner. 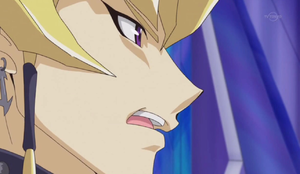 Jack silently watched as Yuya angrily told Jack not to insult his father's Dueltaining before passing out. Jack later watched the opening proceedings for the first day of the Friendship Cup. After the first day of the Cup ended, Jack was invited to dinner by the High Council, who also had Declan and Riley as guests. Gael asked if he agreed that Zuzu Boyle was the most impressive Duelist out of the first day, and Jack explained that she seemed as if she was trying to reach someone with her Duels. Jack pointed out that Riley was supposed to Duel as well, with Declan apologizing for the replacement. Jack revealed he had been looking forward to Riley's Duel, saying that he himself had once had the same haunted expression in his eyes. Jack went on to explain his past and how he found the "Tuning Magician" card, which inspired him. Jack told Riley that if he had a goal to accomplish, he must not falter. During the second day of the first round, Jack continued to watch the Duels, and when Yuya informed the crowd of the fate of the losers in the Friendship Cup, Jack criticized him, noting that Yuya expected the crowd to listen to him despite not having proven that he was a winner. However, Jack was shocked for the first time in the tournament when Yuya began to Duel aggressively and brutally defeated his opponent, Officer 227. 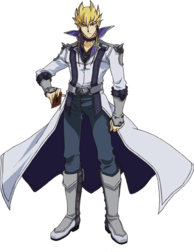 He watched the rest of the Duels in the first round, remaining unmoved during the brutal climax of the Duel between Dennis McField and Shay Obsidian, during which the former revealed that he was from Duel Academy. Jack left the arena after Shay brutally defeated Dennis. Jack returned the next day to watch the second round Duels from his special skybox on his own again. When Yuya Summoned "Tuning Magician", a card Jack gave to Sam, Jack wondered how Yuya obtained it. He smiled when Yuya revealed how the seemingly adverse effect of "Tuning Magician" had set up "Enlightenment Paladin" and its finishing blow. He was pleased with the outcome of Crow's Duel with Shay, smiling despite one of his posters being damaged in the final attack. Jack declares Yuya's Duel to have been boring. He later observed the semi-final Duel between Yuya and Crow. Following Crow's defeat and Yuya's brutal Dueling, Jack was not impressed with the match, declaring it boring, and walked away. With Yugo not showing up, he was instead selected as Sergey's opponent in the second semi-final match. Before the match, he talked to Sam, who told Jack he finally understood why Jack gave him "Tuning Magician", and Jack concluded that Sam indeed gave Yuya the card. Jack explains the "King's Duel" to Sergey. Jack told Sam that all cards have a purpose and people do as well. He gave Sam the task of delivering this message to Yuya. After Jack began his Duel with Sergey, Sergey attempted to use the effects of his "Earthbound Servant" Fusion and Synchro Monsters to defeat Jack but Jack countered each one. After Sergey played "Earthbound Tundra", Jack was still unconcerned, as he believed that its conditions applied to Sergey and that he could outpace him. When Sergey merged with his own Duel Runner and boasted about it, Jack still wasn't worried and even called it boring, and became annoyed when Sergey weakened his "Scarlight Red Dragon Archfiend". As the Duel continued, Sergey used the effect of "Earthbound Servant Geo Gremlin" to give Jack the choice of either destroying "Scarlight Red Dragon Archfiend" and skip Sergey's Battle Phase or allowing Sergey to restore his LP. Jack chose to keep "Scarlight Red Dragon Archfiend" on the field, explaining that his dragon was the embodiment of his pride and his soul. After Sergey Summoned "Earthbound Servant Geo Grasha", Jack saved his opponent from falling off the track with "Scarlight Red Dragon Archfiend". Jack won the Duel using "Soul Fist" on "Scarlight Red Dragon Archfiend", then witnessed Sergey fall to his demise after he refused to be saved. He returned to the Duel Palace where he waited for Yuya to arrive and accepted his challenge after Yuya vowed to bring smiles back to New Domino. Jack furiously yells at Yuya, telling him he is too conceited. At the Duel Palace, the Commons began rioting until Jack ordered them to stop and watch his Duel with Yuya, explaining that it would decide the fate of New Domino. As the two prepared to Duel one another, Jack told Yuya to show him how far he had come since their last Duel. Jack began the Duel by Synchro Summoning "Red Wyvern" using the same Synchro Materials as he did in his previous Duel, while Yuya countered by bringing out "Timebreaker Magician" and "Performapal Radish Horse". Yuya activated "Smile World" in order to entertain the crowd with his father's Dueling, which greatly displeased Jack, who decided that Yuya hadn't learned anything since their exhibition match. Jack then proceeded to Synchro Summon "Scarlight Red Dragon Archfiend", but the Duel was interrupted by Jean-Michel Roget's squad of Duel Chasers with their "Goyo Emperors". Enraged at Yuya for leaning heavily on his father's Dueltaining and at Sector Security and Roget for interfering with their Duel, Jack activated the effect of "Scarlight" to destroy all the other Special Summoned monsters on the field and inflict the damage to Yuya. Jack and Yuya ride through the tunnel. Yuya luckily escaped with "Action" and "Cards", and Jack ordered Yuya to surrender but Yuya refused. Jack watched Yuya Synchro Summon "Enlightenment Paladin" and showed his disdain and contempt that such a monster had the title "Enlightenment." Jack continued to hold the upper hand and tried to destroy "Enlightenment Paladin", but failed. At the same time, he continued to speak and made Yuya realize his own not-borrowed style. Jack show his displeasure and impatience with Yuya until he watched in shock and delight at the birth of "Nirvana High Paladin". With the Duel unexpectedly becoming the one he wanted from Yuya at the beginning of the match, Jack responded to Yuya's Synchro Summon by Synchro Summoning "Tyrant Red Dragon Archfiend", shocking everyone with the hidden extent of his strength. Jack continued to teach Yuya the true essence of Dueling and watched in amazement at Yuya's daring Pendulum Summon of a full monster field. Jack accepts his defeat to Yuya. Even though Jack powered up "Tyrant" to 10000 ATK, he was defeated when Yuya used the Pendulum Effect of "Nirvana High Paladin" on his full field of monsters in combination with "Smile World". Jack smiled as the final attack fell, and announced to the whole of New Domino City that he was proud of and honored to Duel with Yuya. He was present to learn the Council's decision to disband and resign, as well as the dissolving of the Topsiders-Commons system. Jack finally understood what Yuya's philosophy meant and was pleased to see Yuya unite both the Topsiders and Commons like a true king and star. Jack and Crow crash through the glass of the Sector Security Building. Jack watched in surprise when Sora Perse suddenly appeared on the city's viewscreens and delivered the alarming and distressing news that Roget had kidnapped Zuzu again. He and Crow took off on their Duel Runners, going after Yuya and joined him in front of the Sector Security building, intent on stopping the selfish Roget. Jack and Crow crashed through the glass doors and forced their way into the building. They ran around with Yuya, looking for Zuzu, and reunited with Riley and Moon Shadow, only to learn that Declan was Dueling Roget in a locked room trying to rescue Zuzu. Once Sora arrived and confirmed that he could open the locked door, Jack and Crow exchanged glances and left the Lancers. The two successfully set up an ambush on Roget, simultaneously creating a chance to free Zuzu. Jack told Roget he would never forgive him for putting New Domino in chaos and danger, and he had "Scarlight Red Dragon Archfiend" destroy the elevator, but to his horror he accidentally put Zuzu in further danger. He, Crow, and the Lancers watched happily as Yuya and Zuzu were reunited. Jack was furious when Roget revealed his plans to take the Lancers to the Fusion Dimension and trap New Domino between dimensions and activated his dimensional travel machine. However, neither "Scarlight" nor Crow's "Assault Blackwing - Raikiri the Sudden Shower" could stop Roget and the machine. Jack witnessed Roget being pulled in a wormhole and watched in shock as moments later, Zuzu, Yuya, Shay, Gong, and Sylvio got pulled into a second wormhole and disappeared. Declan explained that there was no way to know which dimension the others had been transported to. Jack did not depart with the Lancers to the Fusion Dimension, and remained to assist in rebuilding New Domino City. Amanda, Frank, and Tarren asked him to go help Crow and the others, reassuring him that he could leave New Domino City to them, and Jack took his Duel Runner to the Fusion Dimension and made his way to Duel Academy. Jack suddenly comes speeding into the Duel Arena to save Gong. Jack came speeding down an entrance to a Duel arena on his Phoenix Whirlwind just as the Battle Beast was about to seal Gong into a card, surprising everyone present. He sped around the arena while taking the intrusion penalty and told Sanders that he was not one of the Lancers, but certainly one of their comrades. He told Yuya how the kids had asked him to help Crow, but was shocked to learn that Crow had been sealed into a card by the Battle Beast. Warning the Battle Beast that he would crush him, he Synchro Summoned "Scarlight Red Dragon Archfiend" and destroyed the Battle Beast's "Gladiator Beast Gyzarus" with the effect of "Scarlight". The Battle Beast feared a direct attack from "Archfiend", but Jack explained that the effect of the "Red Warg" that he had used as Synchro Material preventing him from attacking, relieving the Battle Beast. Sanders then joined the Duel and Jack noted that Yuya seemed hesitant and he asked Yuya what was wrong. Yuya explained that he believed that there was something wrong with the Battle Beast. As Sanders declared that his and the Battle Beast's orders were to eliminate Yuya, Jack warned Sanders that he did not care what his orders were and that with Yuya as his partner, Duel Academy could not stop them. He told Yuya, who was lost in thought, to wake up and to express his feelings in a Duel. To his shock, the Battle Beast used the effect of "Gladiator Beast Tamer Editor" to destroy itself and eliminate Sanders from the Duel. Jack along with Sylvio helps Gong to stand. Jack saved Yuya from the effect of "Gladiator Beast Fort", but when Yuya tried to stop the students from sealing their instructor into a card, Jack explained that shouting wouldn't erase the teachings drilled into their heads, but shaking their hearts would. 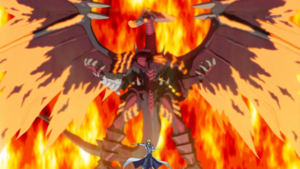 He Synchro Summoned "Tyrant Red Dragon Archfiend", using its effect to destroy all cards on the field. However, this backfired as the Battle Beast activated "Gladiator Beast's Great Fortress". Jack commented that cowardly enemies would try to look intimidating, but the "Great Fortress" was ridiculous. He attacked directly but the Battle Beast activated the effect of "Great Fortress", letting him Special Summon "Gladiator Beast Andabata" with 4000 ATK and forced "Tyrant" to battle it, which would end up in Jack's defeat. 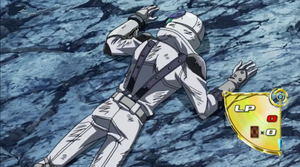 Using the "Red Armor" in his Graveyard, Jack saved his Life Points once more, and he told Yuya to focus on what he should be doing instead of worrying about him, motivating him to tear off the thick armor covering the Battle Beast's heart. 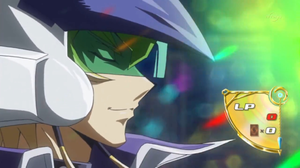 He smiled as Yuya activated "Guard Dance" and remarked how Pendulum Summoning was Yuya's words. 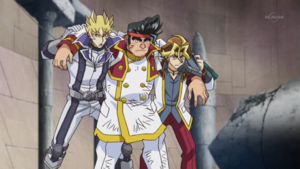 After Yuya won the Duel, Jack told Yuya to hurry and go ahead as he and Sylvio helped up the injured Gong. Jack arrived outside Duel Academy as Gong was about to join the Duel between Shay, Kite Tenjo, and Zarc, and Jack told Gong to wait as he sped down the road. They both joined the Duel, receiving intrusion penalties and watched Zarc defeat Shay and Kite. He correctly guessed that Yuya and the Four Dimension Dragons had united to form Supreme King Z-ARC and declared his intention to regain the remains of Yuya's heart. Jack and Gong declared that they were Zarc's opponents now. Jack is defeated by Zarc. Jack quickly Synchro Summoned "Scarlight Red Dragon Archfiend", intending to drag Yuya from hiding as Yuya did the Battle Beast. Jack attempted to use the effect of "Scarlight", but his Synchro Summon allowed Zarc to Synchro Summon "Supreme King Dragon Clear Wing" during Jack's turn. Jack managed to prevent the effect of "Clear Wing" from destroying "Scarlight", but he was unable to destroy "Clear Wing". Jack told Yuya that he wouldn't give up no matter how many times he was deflected, even if there was no road in front of him. Gong set up protection for "Scarlight" with "Superheavy Samurai Warchief Heavystrong", vowing to Zarc that he would protect "Scarlight" no matter what happened to him, and Jack decided to use the road Gong paved for him to defeat Zarc. New Domino City began materializing in the Fusion Dimension, and Jack sped for a highway as it materialized, successfully traversing it. As he reached the road, Jack used "Vision Synchro" to Synchro Summon "Tyrant Red Dragon Archfiend" using monsters from his hand. With his dragons protected by the effect of "Warchief Heavystrong", Jack attacked "Clear Wing", but while his dragons were protected, the effect of "Clear Wing", amplified by "Supreme Presence" defeated Gong. Jack explained to Yuya that Gong had sacrificed himself to give him a chance, and he vowed to use it to strike Yuya from his soul. He destroyed "Clear Wing", but Zarc used the Pendulum Effects of "Supreme King Gate Zero" and "Supreme King Gate Infinity" to convert the damage into LP. The effect of "Vision Synchro" returned "Tyrant Red Dragon Archfiend" to Jack's Extra Deck, leaving only "Scarlight" on Jack's field. As Sylvio and a restored Crow joined the Duel, Zarc personally attacked and destroyed "Scarlight", defeating Jack and blasting him through the Duel Palace. Jack was thrown off his Duel Runner, barely ducking as the Phoenix Whirlwind nearly crushed him. Passing out, he left the Duel to Sylvio and Crow. When Crow Synchro Summoned "Assault Blackwing - Raikiri the Rain Shower", Jack knew that Zarc would do the same during Crow's turn. Jack was surprised when Crow was able to deal damage to Zarc and when Zarc Summoned "Supreme King Dragon Odd-Eyes". To Jack's shock, it appeared that Sylvio had been able to destroy "Z-ARC", but Zarc was protected by the presence of the Fusion, Synchro and Xyz Monsters in the Graveyard, including Jack's "Scarlight". Leo Akaba joined the Duel, and Jack was surprised to hear Leo and Zarc mention four cards needed to defeat Zarc. When Declan was telling Yuya how he moved people's hearts, Jack reminded Yuya how he moved the hearts of New Domino's people. Jack was surprised when he thought "Zarc" killed Declan. He and Crow were pleased when Ray turned all of Zarc's Synchro Monsters into Normal Monsters with their effects negated. 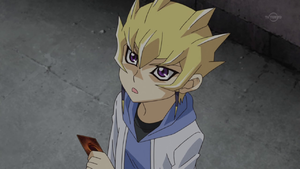 Jack watching Yuya and Shay's Duel. Following the battle with Zarc, Jack returned to the Fusion Dimension to watch Yuya and Shay's Duel. After Yuya won and declared that he would save Zuzu and Lulu, Jack called him conceited and told him that he couldn't save anyone in his current condition. Jack explained that Yuya feared using the Four Dimension Dragons because of the possiblity that he would reunite with them again. He told Yuya he was disqualified as a Duelist for not having free control over his dragons, despite their ferociousness. Yuya claimed that he refused to use the dragons out of fear of hurting Riley and that he wanted to make her smile without them. Jack replied that Yuya mustn't hesitate, and use the four dragons if he wanted to achieve his goal. He and Yuya Action-Turbo Dueled on the Multiverse Speedway that had been activated throughout the Four Dimensions. 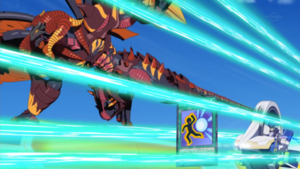 Jack quickly brought out "Scarlight" and told Yuya to bring out the four dragons, but Yuya was still hesitant and instead attacked with "Odd-Eyes Pendulum Dragon" and his "Performapals". Jack fended off the attack, and told Yuya he was unsatisfied with the Duel and used "Scarlight" to destroy all of Yuya's monsters and deal damage, except "Odd-Eyes", leaving Yuya one chance left to bring out all four dragons. However, Yuya still refused, revealing that he also feared something could happen to Zuzu, Celina, Lulu, and Rin as well. Yuya attacked "Scarlight" again using the same combo, but Jack repelled the attacks again. Disappointed in Yuya for not bringing out the four dragons, Jack warned him he would destroy him on his turn. He brought out "Tyrant Red Dragon Archfiend" and attacked Yuya's monsters with both of his dragons, but Yuya negated the attack of "Scarlight" and the effect of "Tyrant" with the effect "Performapal Odd-Eyes Dissolver". 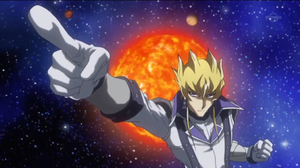 Jack subsequently destroyed Yuya's monsters with the effect of "Scarlight" except "Dissolver" due to its own effect. On his next turn, Yuya revived his monsters for the third time, angering Jack as he thought Yuya was trying to repeat his ineffective combo. Yuya clarified that he understood what Jack meant, and Jack told Yuya to show his strength as a master who controlled the four dragons. Yuya obliged, assembling "Dark Rebellion Xyz Dragon", "Clear Wing Synchro Dragon", and "Starving Venom Fusion Dragon" alongside "Odd-Eyes". Jack evading "Starving Venom Fusion Dragon's" attack. Upon its Fusion Summoning, the effect of "Starving Venom" allowed it to gain the ATK of Jack's monsters and the effect of "Scarlight", which Yuya proceeded to use against Jack. Jack blocked the stolen effect with "Invalidate" and told Yuya to come at him seriously and show the Four Dimension Dragons' power in battle. Yuya obliged, first weakening Jack's "Red Dragon Archfiends" with the effect of "Dark Rebellion" and attacking "Tyrant" with "Starving Venom" and "Dark Rebellion", and "Clear Wing". Jack used Action Cards to protect "Tyrant" from the first two attacks, but it was destroyed by the attack of "Clear Wing", though Jack was able to remain in the Duel by using the second effect of "Invalidate" to halve the damage. Yuya then attacked "Scarlight" with "Odd-Eyes", and Jack used "Rejuvenation" to increase the ATK of "Scarlight". To his surprise, "Clear Wing" helped Yuya grabbed an Action card that powered "Odd-Eyes" up enough to destroy "Scarlight" and defeat Jack. Despite his defeat and his admission that Yuya was the master of the Four Dimension Dragons, Jack warned Yuya that he didn't hear Yuya's soul roar during the Duel before he sped off. He subsequently watched Yuya and Declan's Duel in Paradise City. When Yuya Synchro Summoned "Odd-Eyes Wing Dragon", Jack excitedly mused that he felt the beat of Yuya's existence for the first time and told him to go down his road without hesitation. He was surprised when Yuya used the Pendulum Effect of "Performapal Five-Rainbow Magician" to lower the ATK of his and Declan's monsters to 0, and watched as Yuya and Declan gathered Action Cards to in order to bypass the effect of "Performapal Five-Rainbow Magician". Jack was pleased when Yuya won, and he was sent back to the Paradise Stadium by Ray to witness her revival as Zuzu. Jack stands alongside his ace, "Scarlight Red Dragon Archfiend". Jack uses a "Red" Deck, which, similar to his 5D's counterpart, seems to focus mainly on power. He swarms the field with various monsters to perform Synchro Summons and uses powerful Synchro Monsters to overwhelm his opponent with card-destruction effects and high ATK for OTK tactics. He also uses cards his 5D's counterpart used or similar ones, like "Resonator" monsters and "Crimson Blader". Much like his 5D's counterpart with "Red Dragon Archfiend", Jack aims to bring out his "Scarlight Red Dragon Archfiend" as soon as possible and keep it alive throughout the whole Duel, using many effects to protect and strengthen it, including several hand traps. ↑ 1.0 1.1 1.2 1.3 1.4 1.5 Yu-Gi-Oh! 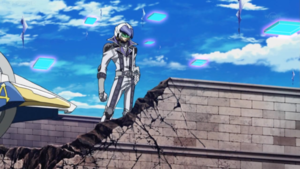 ARC-V episode 54: "City 'Scape"
↑ 3.0 3.1 3.2 3.3 3.4 3.5 3.6 3.7 Yu-Gi-Oh! ARC-V episode 64: "Match with the Master"
↑ 4.0 4.1 4.2 4.3 Yu-Gi-Oh! ARC-V episode 65: "Traits of a Traitor"
↑ 5.0 5.1 5.2 5.3 Yu-Gi-Oh! 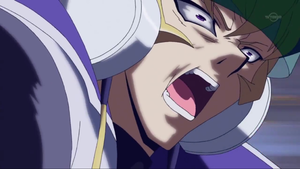 ARC-V episode 93: "Road Rage: Part 1"
↑ 6.0 6.1 6.2 6.3 Yu-Gi-Oh! ARC-V episode 94: "Road Rage: Part 2"
↑ 7.0 7.1 7.2 Yu-Gi-Oh! ARC-V episode 70: "The Gift of Grit"
↑ 8.0 8.1 Yu-Gi-Oh! ARC-V episode 79: "Road To Rebellion"
↑ 17.0 17.1 Yu-Gi-Oh! ARC-V episode 98: "Friendship Finale"
↑ 18.0 18.1 Yu-Gi-Oh! ARC-V episode 99: "A Vicious Cycle"
↑ 19.0 19.1 Yu-Gi-Oh! ARC-V episode 121: "Brand of Misfortune"
↑ Yu-Gi-Oh! ARC-V episode 145: "Closure By Cards"
↑ This monster is shown in a flashback in episode 65. ↑ 2.0 2.1 This card can be seen in his hand in episode 64. This page was last edited on 13 June 2018, at 05:39.